If you own more than two hamsters, then you might have noticed that sometimes they exhibit strange behavior. All animals have a specific body language to express their emotions to each other and towards human too. If you’ve ever experienced the rage of your hamster, then you already know that they can be dangerous also. Usually, hamsters are not that aggressive, but some situations can lead them to attack the humans. They can even bite you under some critical circumstances. You might not know when hamsters attack, but there are undoubtedly some things that can give you an idea why they are mad. Usually, hamsters attack when they feel threatened. They are very protective of their mates and food, and even toys too. So, if they see a third person touching them, they can be a little bit irritated and attack the person. And if they bite you, it can cause severe damage. What are the most common reasons for the hamster to attack humans? What to do if you get bit by a hamster? How to Stop Hamsters from Attack? Hamster doesn’t have sharp eyes. They can’t see clearly, and hence they rely on their nose to identify people. Thus, if you take your hand closer to them smelling like some food item, then they are most likely to bite you. This isn’t a real attack, but still, their bite will make you bleed. We have already established that hamster identifies things with their nose. Thus, if they smell some confusing scent, then they will get alarmed and attack you as an act of defense. When a hamster isn’t handled by a person correctly, then they might attack them too. They do this hoping to get away from the person. If you try to disturb the hamster during their sleep time, then they are most likely to attack you. These cute pets love sleeping most of their day. So, if you disturb them from their sleep, then it is obvious for them to get angry. When hamsters are hungry, they tend to get angry and aggressive. Hunger can do that to anyone. Try to separate them from the fight: If two of your hamsters are fighting and you try to separate them, then they will attack you instead. In any of these scenarios, there is a possibility that hamster will bite you. And in case it happens then you will need to take some actions too. Don’t shake your hand to make the hamster release the grip. Just take the hamster to its cage, and it will automatically let go of your hand. Don’t shout at the hamster or it will bite you again. Clean the wound with warm water and use anti-bacterial solution to dry out the wound. Then just place a bandage on the injury. Check the wound daily and replace the bandage too. If the injury is swollen, then you will need some strong antibiotics. There is no doubt that hamsters make truly great pets, as they are low-maintenance, don’t occupy too much space and they are cute. Unhappily, some hamsters have a bad habit of attacking. 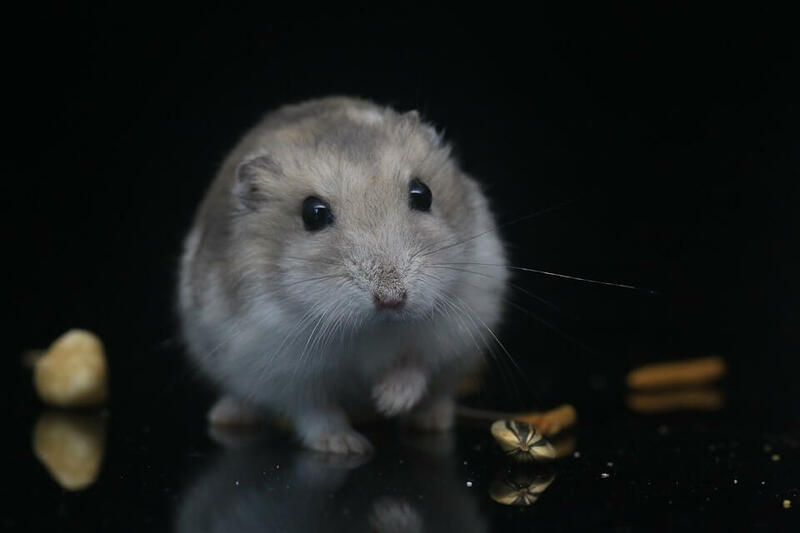 However, this hamster behavior can be prevented easily and here are some helpful tips you can follow to stop your pet from attack. You know that when hamsters attack. They generally attack when they are afraid. When you bring your pet home for the first time, your pet will likely be a little bit of nervous. You need to give your new hamster time to get used to you, and new atmosphere. Also, you can spend some time near your pet cage and try to talk to your pet. In this way, your pet will get used to your presence and scent. Hamsters depend on their sense of smell as they have poor eyesight. If your hamster smells something unusual, like the scent of another pet or food, then your pet might attack. That’s why you should wash your hands before touching or handling your pet. Try to place your hand inside your hamster cage and then, let your pet smell you. If your pet does not like to interact with your hand, then don’t force your pet. Otherwise, your pet can attack you. Place your hand in your pet cage for 5 minutes on a regular basis for a week. This is the best way to interact with hamsters. You can easily build a positive interaction with your hamster if you feed your hamster treats it likes. Amazingly, hamsters like nuts, fruits, and vegetables very much. Hence, try to feed your pet with your hand instead of placing its treat in the cage. Also, don’t feed your hamster too much as too much can cause some health problems for your hamster. You should never disturb your hamster while he or she is sleeping. Otherwise, your hamster can attack you as hamsters get angry if their sleep gets disturbed. That’s why you should play with your hamster on her or his own schedule, and you should never disturb your pet when he or she is not interested in interacting with you. Even gentle and kind hamster can attack. If your hamster attacks you, then it does not mean your hamster wants to hurt you. It is just because your hamster feels threatened. So, the next time when hamsters attack, you know exactly what to do! !